1. Today I will talk about food. Yes, random notes about food. Sorry if I am going to make you hungry haha! 3. Sometimes I don't feel like eating anything outside no matter how nice the food are. I just want to stay home and eat instant noodles! My favourite is Cintan brand's asam laksa! When I cook Cintan's asam laksa, I like to put in lots and lots of tomatoes! 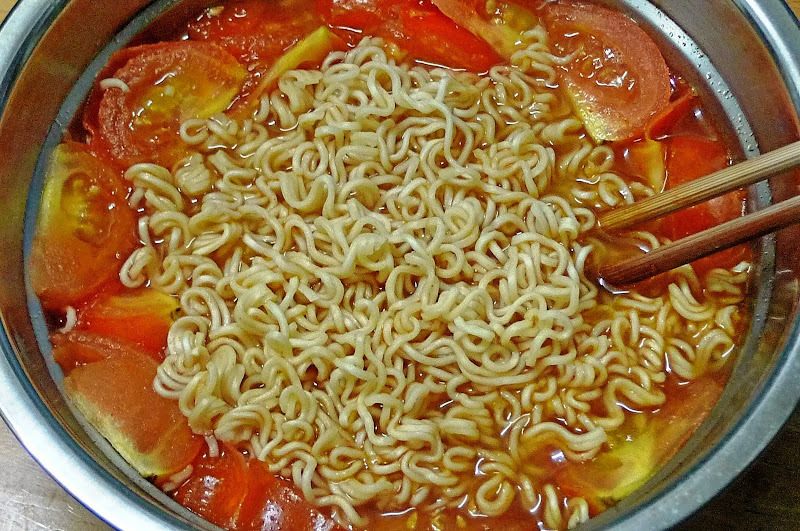 Do you have cravings for instant noodles? It's unhealthy no doubt, but I think it's OK to eat it once in a while. 4. I seldom go Secret Recipe for cakes nowadays. 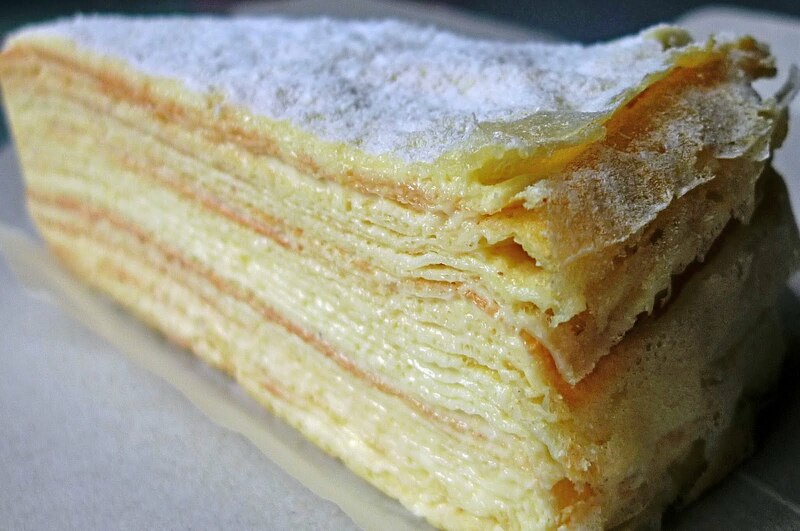 Instead my favourite cake at the moment is Food Foundry's Mille crepe cakes! I love their strawberry crepe cake! But you know, their vanilla crepe cake is even better! Gosh, I am drooling just looking at this! The only thing that is stopping me from eating these crepe cakes is the price. At RM9 per slice, I will surely go bankrupt in no time eating it everyday! Besides, cakes are basically unhealthy. They are high in sugar and transfat. A big no no to a healthy diet. But again, indulging once in a while is OK.
5. Last time when I was small, I used to eat fried nian gao with yam and sweet potato during every Chinese New Year. 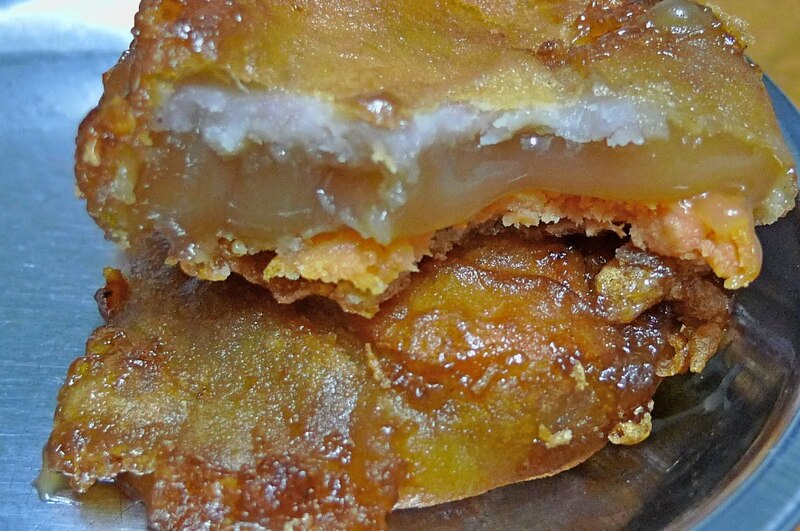 In case you don't know what nian gao is, it is a type of Chinese cake made from glutinous rice. Nowadays, you can find these sweet delicacies being sold all year round. I have eaten the nian gao sold in SS2 PJ, but recently I came across a far better one from Reminisce Cafe in Mid Valley. Can you see the brown nian gao paste sandwiched between the yam (upper) and sweet potato (below) ? Gosh! Just look at the nian gao paste oozing out! Yummylicious!! Totally unhealthy because of its high oil and sugar content, but what the heck! I need this as comfort food! LOL! 6. 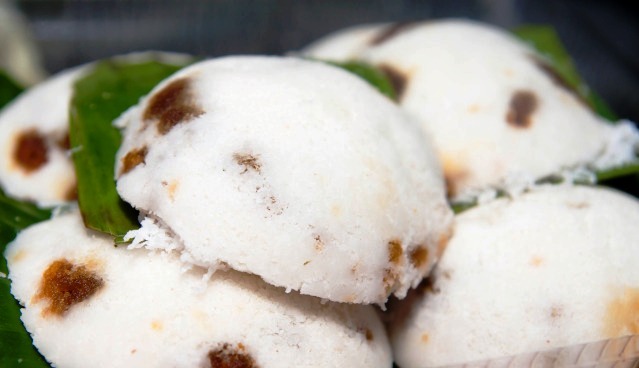 I still remember how the lovely aroma of a freshly steamed putu piring enticed me when I was very small. Taking a bite of the putu piring was absolute heaven. That was during my primary school days. Since then, I had never had the chance to taste another putu piring! That is about to change soon. They say the best putu piring is found in Melaka at this place called Tengkera. I am so going there to get a taste of it! Why do I like putu piring so much? Probably because it has two of my favourite ingredients - gula Melaka and grated coconut! Yummy!! 7. Christmas is not even here yet, but I am already fantasizing about the delicious yee sang for the coming Chinese New Year in February next year! 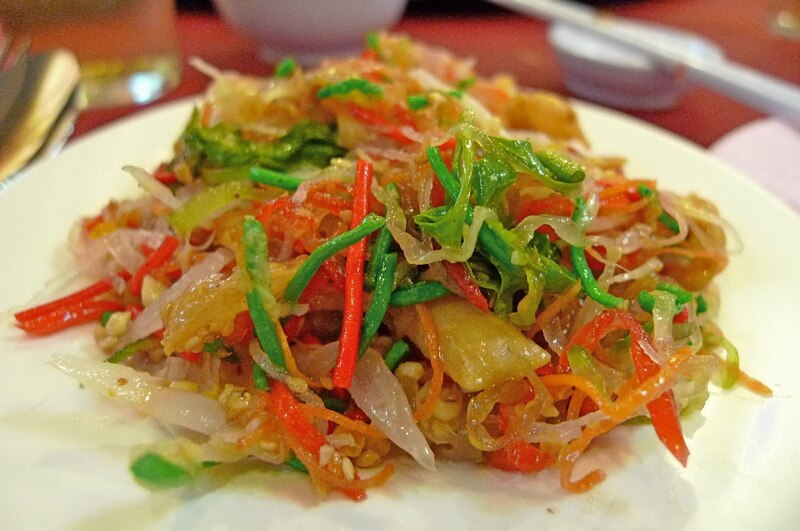 Yes, I love yee sang and to me, it's a sin not to eat it during Chinese New Year! If only the restaurants sell yee sang the whole year round instead of the very limited 15 days of Chinese New Year! I can't see the snow yet. Perhaps the internet connection is too slow right now. That is why...snow can't be delivered here. Yeah!I love yee sang too. Just hope I can enjoy it next year.This year...takde chance..
anyway,.. i have to eat my breakfast now... yikes a cup of coffee and 2 pieces of pan cake sobs!! I'm so hungry especially after my morning workout. 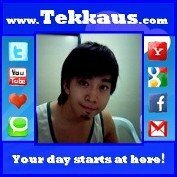 So what would you recommend to have for breakfast? Bad for Foong to post up yummy photos and for me to read it so early in the morning! when I'm lazy to cook, Cintan or Maggi is always convenient. I love putu piring too and instant noodles. And like you I like to put tomatoes in my noodles. Yum yum hor. Oh my I love dat strawberry crepe cake! But the vanilla one is bugging me now, I oso wan! Nian gao is kuih bakul is it??? And putu piring oso my fave, yes u are making me very hungry this wet rainy afternoon Foong! i love the vanilla crepe and the leen koe.. gosh! see these pics no more sick liow! Woahh.. the CREPE CAKE! I miss that! Wanna eat more of that again... I wonder if they'll have durian flavour during the durian season! 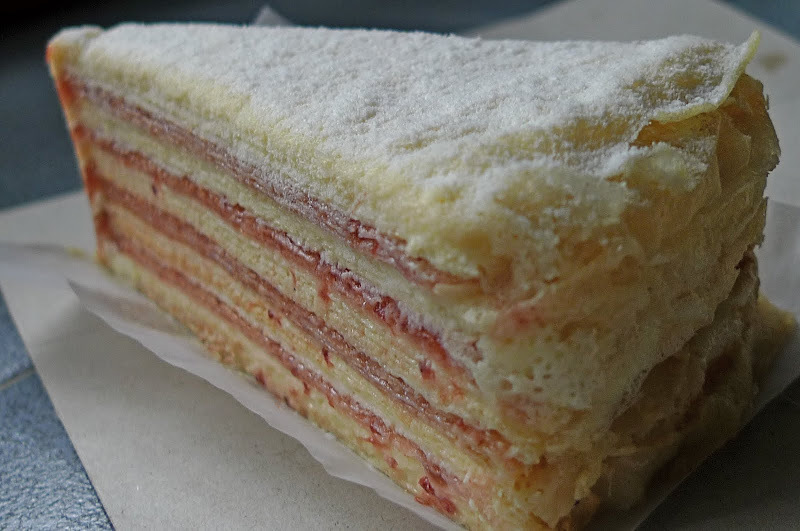 errr, nope woh, i didn't see your blog snowing woh.. in fact i got error lah, maybe your blog is too heavy to load so the snow never comes out..
wow, nice mille crepe!!! btw, where is food foundry?? RM9 a bit expensive but once in a while still acceptable lah..
oh, fried nian gao!! have you tried the stall in brickfields?? very nice, with sweet potato and yam, most of the time you need to queue up before you can get to buy some..
putu piring, err, can survive without that lah, haha!!! and i think it's about time yee sang is coming back, no surprise at all even it's still not yet christmas..
Oh, the putu piring so near your home? So I can visit you after buying the putu piring there! Why you hate tomatoes? I love them so much! Oh, you have putu piring in Philippines too? Amazing! 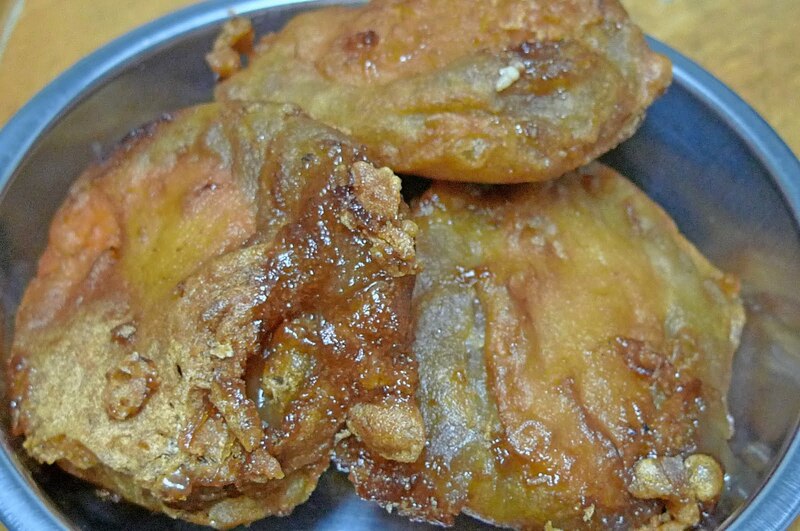 I want to eat puto when I visit Manila! lina, Oh I have never tried Maggi tomyam cos I seldom eat instant noodles haha! So what are you having for breakfast? khengsiong, yeah adding vegetables is healthier. You don't seem to fancy cakes as the only thing you like about Secret Recipe is their soba. Huh? Eric doesn't like tomatoes? I love it and yes, it does make the instant noodles meal more healthier! Yes, I still owe you the crepe cake, but you are not here to eat it! You have never tried nian gao with sweet potatoes? You should try it! Ooh, can't wait to eat tang yuan! Delicious!! mariuca, haha! You must go try both the strawberry and vanilla crepe cakes! Guarantee nice! Yes, I just found out nian gao is kuih bakul haha! iamthewitch, no durian cakes cos I just asked them a few days ago! Haha! 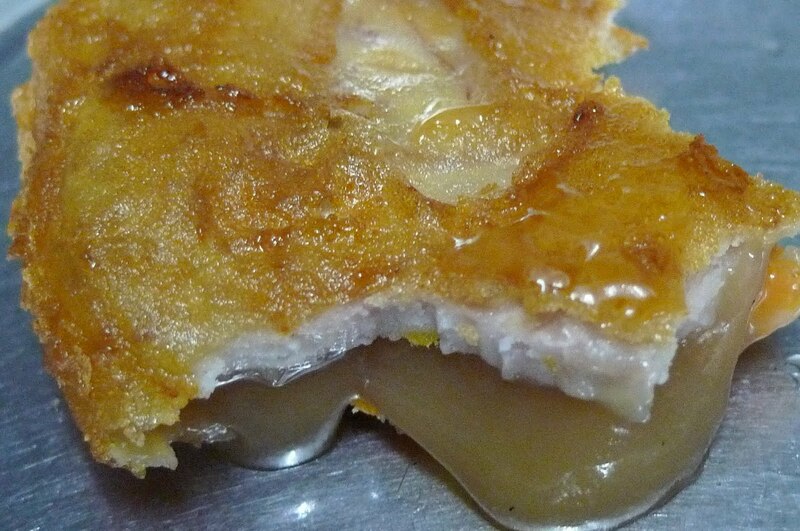 Yes, the fried nian gao is indeed fattening, but it's delicious so I will still eat it LOL! SK, I didn't continue with the Dusit Thani post cos this post seem more urgent LOL! How come you can't see the snow? Either something wrong with your eyes or with your computer! Haha!! Sausages and bacon? Goodness! So unhealthy! Switch to tomatoes for a healthier life! LOL! Food Foundry is located at Happy Mansion in Sec 17, PJ. Go eat the crepe cakes! I seldom go Brickfields so no, haven't tried the nian gao there! Why don't you buy some for me? Haha! i love unhealthy food ahahahah!! Instant noodles... students' life saviour! :p I love them too! hahah! I love Maggi Assam Laksa! I read that tomatoes (in any form) are good against prostate cancer, so you are eating something right. My! The crepe cakes look delish! I get my fix of neen kou at the stall in the Imbi Road area. The stall is just located outside the corner coffeeshop that serves the famous beef-ball noodles. They don't seem as oily though but the ones in your pictures look really inviting with the neen kou oozing out. These days, yee sang is being served for more than the 15 days. Most hotels have stretched the yee sang period. Saw snow falling yesterday but encountered some glitch (Wowzio) at the same time. Today, no snow encountered and the site is loading fine. hey me too! I love my instant noodles and i like Cintan too! It's just awesome. Food! I just came back and you welcome me with foods eh...yummy. Merry CHRISTmas Foong. It is good to be back here on your blog. the vanila crepeee looks good!! Have you tried the Cintan asam laksa? It's very delicious!! Food Foundry is at Happy Mansion in Sec 17. Go google it! And you must go try the nian gao at Reminisce Cafe! Very delicious!! happysurfer, yes tomatoes are healthy food! So to counter the unhealthy instant noodles, I put in some tomatoes haha! Oh! I have never bought nian gao from the stall at Imbi Road cos I seldom go there! Must look out for it if I go there next time, Thanks!! Yes, they seem to be serving yee sang earlier and earlier to make more money!! Wonder why is there a glitch with the snow fall here? So far, I have not encounter any problem. eiling lim, high 5!! Now I know we both love Cintan instant noodles! Yummy!! ayie, oh you know how to make crepe cakes? I want to taste your crepe cakes!